Now you can order any alcoholic beverage from BevMo! to place into one of these baskets! 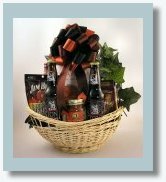 **These baskets DO NOT contain any alcoholic beverages; only cider. 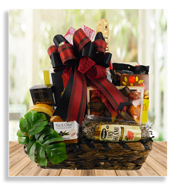 A very special occasion calls for a spectacular gift. 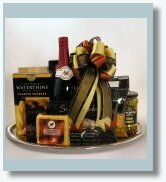 This elegant sterling tray design is over-flowing with tantalizing upscale gourmet food selections. We begin with a cutting board in the shape of a putting green with a 19th hole flag, and load it up with delicious gourmet foods. 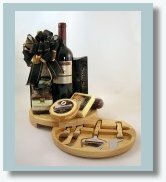 A unique cutting board with cheese knives will showcase your personal selection of wine or champagne. Enjoy a cold brewski and snacks with your buddies! Select your favorite six pack of beer through BevMo! 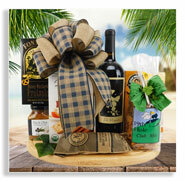 A very special gift to which you may add your choice of alcohol. 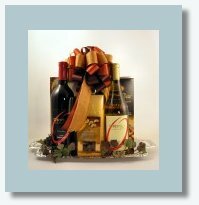 An elegant silverton serving tray presentation with two wine selections, Godiva chocolates, savory food and coffee. 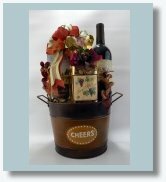 A gorgeous presentation into which your choice of champagne or wine can be added. Packed with pizzazz and loaded with glitz, This delightful design will get the party started! feature addtional designs into which you can add the spirit of your choice.